Auryn Macmillan grew up in Melbourne, Australia, and won a basketball scholarship to North Carolina, America as a teenager – as a sporting scholar, he is currently on an exciting journey thanks to Plymouth University and the Sporting Excellence Scholarship. 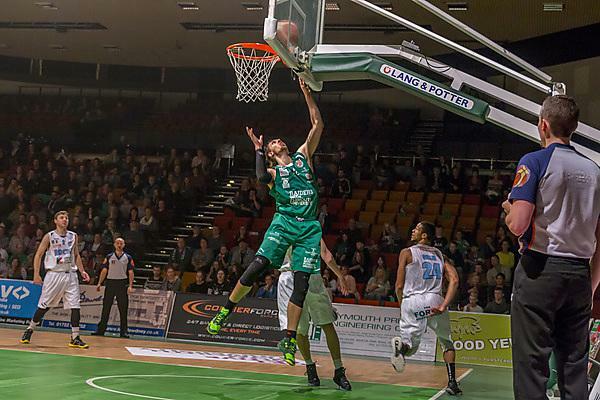 The power forward only started playing basketball at the age of 16, and 12 years later competed in the top-flight sport for Plymouth University Raiders while studying for an MSc in psychological research methods. “I’ve been waiting for an opportunity to continue my education and, when I found out that Plymouth University was a major sponsor of the Raiders, I was absolutely delighted. The University’s opportunities and courses were major reasons for me choosing to sign with the team. So, with training, competitions, publicity work and studying for a masters, how does a sporting scholar fit everything into one day? “I find maintaining a tidy calendar is one of the simplest ways to stay organised and get everything done,” Auryn said. “If it's not in my calendar, I will probably forget it. My routine here at Plymouth has typically been a 7.30am practice session, followed by class, followed by weights, I break for lunch, then I get some extra shots up, and ideally get a massage. “Hard work and great planning are definitely the secrets to success – always be the first into the gym and the last to leave. He has now signed a contract with the Rockhampton Rockets in the QBL club back in his home country, Australia. We look forward to following his future success.